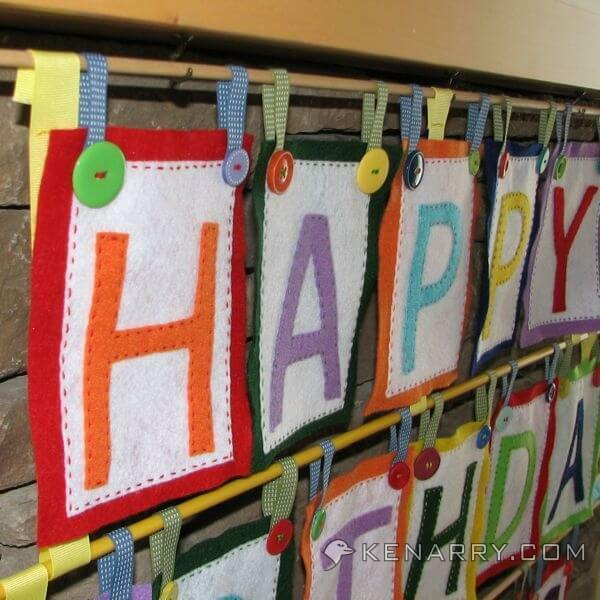 Celebrate birthdays with a DIY Felt Birthday Banner on a wall or mantle. Sew one yourself by hand using this tutorial, incl. a free downloadable pattern. Kick off your birthday celebration with a DIY Felt Birthday Banner you can hang on a wall or mantle. 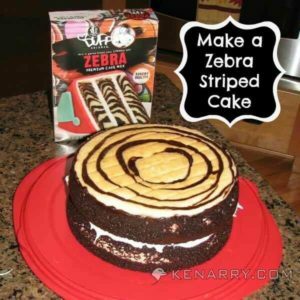 You can easily make one for your family using this step-by-step tutorial. With bright, colorful felt and embroidery floss, this project is easy to sew by hand at night while you’re watching TV. You could also use a sewing machine if want it done even faster. The banner’s interchangeable letters allow you to customize it for each person in your family so they feel extra special when you hang it annually on their big day. Last winter I had the honor of sharing this DIY Felt Birthday Banner tutorial as a guest post on Tatertots and Jello, a fabulous blog where Jennifer Hadfield, a mother of 4, shares creative tutorials and inspiration every day. 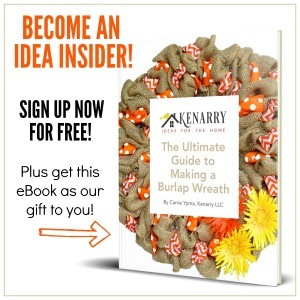 Today, I’d like to share the idea with you, our Kenarry readers! I thoroughly enjoy celebrating birthdays at our house. I decorate our sons’ bedroom doors. I serve them their favorite dinner on a bright red plate that says “You Are Special Today”. 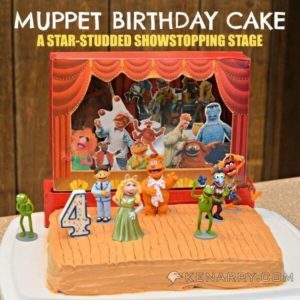 I bake and decorate cakes with whatever characters or animals they’re into at the time. I also hang a banner from our mantle that declares for all to see that it’s their birthday. At first, I had a paper banner that I used for birthdays. But after years of use, it was ripped, wrinkled and ready to be retired. I needed a new banner and wanted to make something that was reusable and could be customized with the birthday person’s name. That’s when I came up with this easy DIY Felt Birthday Banner. At the time, I didn’t have a sewing machine, so I made the DIY Felt Birthday Banner by hand while I was watching TV at night after the kids were in bed. I chose bright primary colors for our banner, but the DIY Felt Birthday Banner could be made in any color scheme you want. For each letter, I layered a background piece of felt, a white piece of felt and a felt letter. 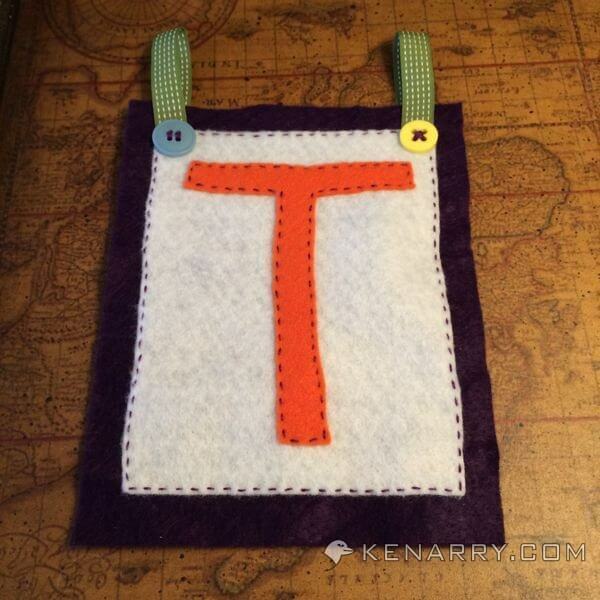 I then attached ribbon loops to hang the letter and finally adorned the letters with assorted buttons. Just follow these easy instructions to make your own felt birthday banner. Step 1: Plan your DIY Felt Birthday Banner. Determine how many letters you need to create and personalize your banner. You may be able to reuse letters from one person’s name to form another’s name. 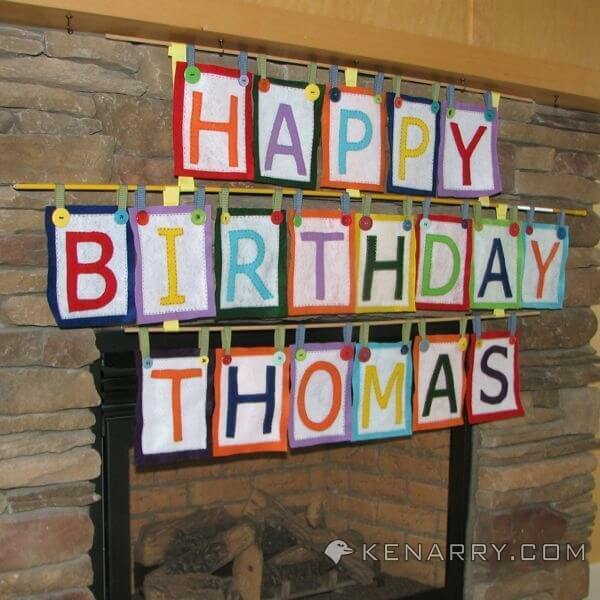 For example, if your first son’s name is Thomas and your second son’s name is Samuel, you can re-use the A, M and S from Thomas’ name when you hang the banner for Sam’s birthday. Also, if you’re a parent, remember to make M-O-M and D-A-D letters for your birthdays too. 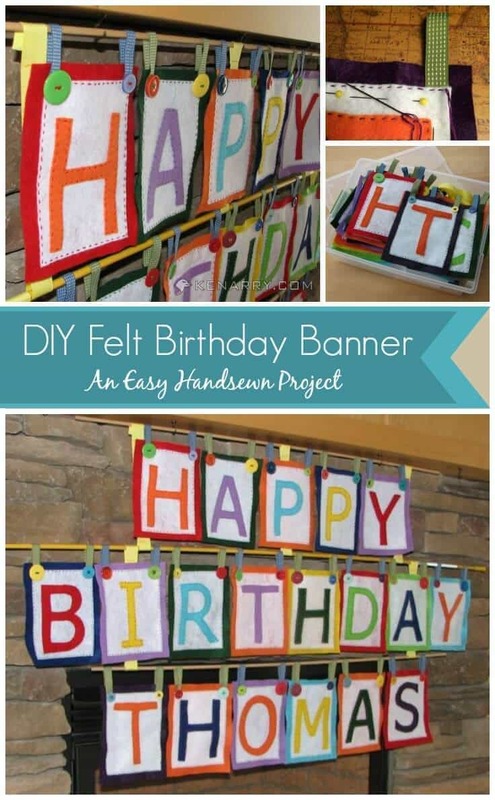 Step 2: Print and Cut Your Pattern For the DIY Felt Birthday Banner. The letters for Happy Birthday and the full alphabet (Tahoma size 450 pixel font). In order to maintain the correct size, make sure your printer’s page scaling is set to none or off when you print. For reference, the large rectangle should be 7″ high by 5.5″ wide when printed. Once you’ve printed your pattern, cut it along the straight edges. You’re now ready to move to the next step. 1. Pin your large rectangle pattern to your colored felt and cut around it. Repeat this several times until you have all the rectangles you need for your banner. 2. Next pin your smaller rectangular pattern to your white felt and cut around it. Again repeat this until you have all the white rectangles you need for your banner. 3. 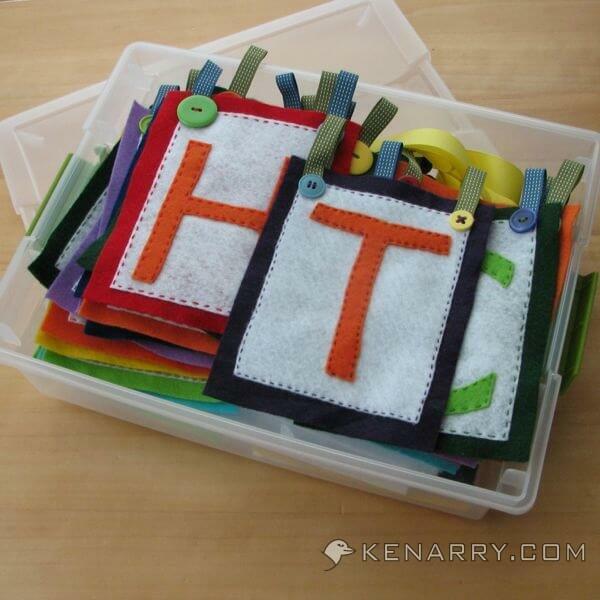 Attach your letter patterns to colored felt. As you do so, if you’re using assorted colors, keep in mind which letters will be next to each other in your banner. For example, you wouldn’t want both your B in BIRTHDAY and I in BIRTHDAY to be red. 4. Last, cut the 1/2 inch wide ribbon into strips using the pattern provided. You need two pieces of ribbon for each letter. 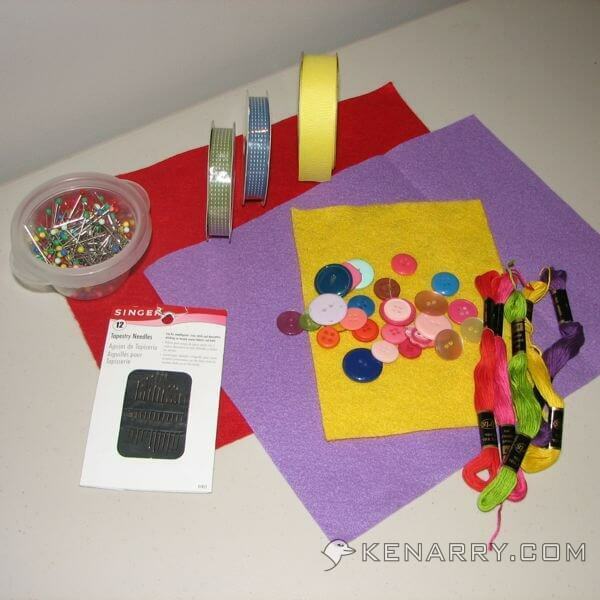 Step 4: Organize and Prepare Your DIY Felt Birthday Banner. As with any sewing project, the majority of the work is in the cutting, preparing and planning. 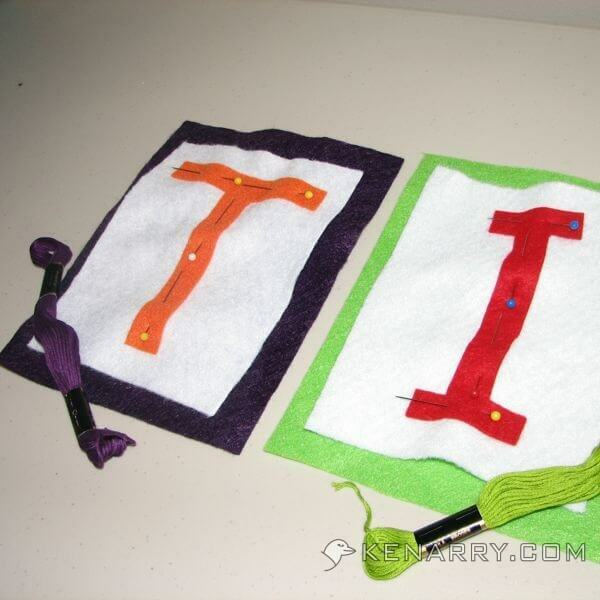 Next, pin the felt letters to the white rectangles using straight pins as shown in the photo below. Now determine which colored background will go with each letter. It may be helpful to lay all the colored rectangles on a large table. Put the white rectangles with each letter on top of the colored rectangles in the order they would appear in the banner. You can then rearrange the background colors until you are satisfied with the order of the colors. Last, determine which colored embroidery floss you will use with each letter. I chose to use embroidery floss that matched the background color. 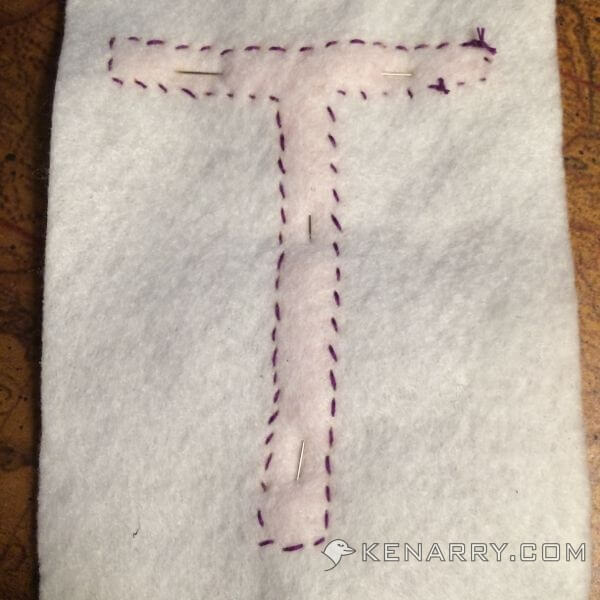 Step 5: Sew the Letter to the White Rectangle. 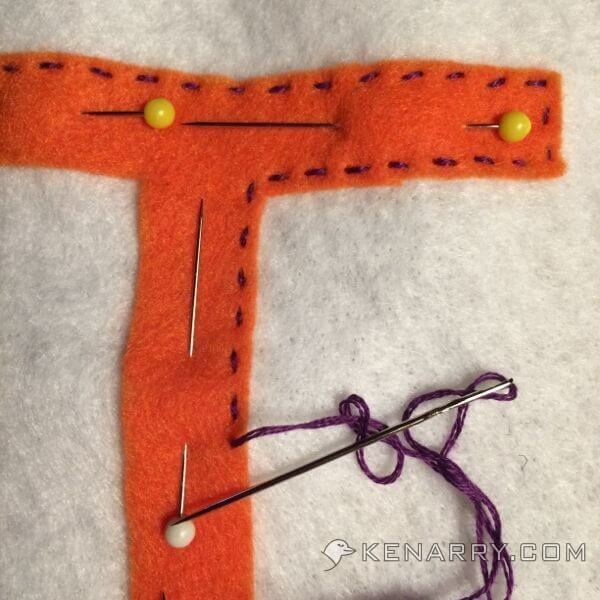 Now comes the easy part – sewing by hand! I chose to use three threads of embroidery floss from each skein. I wanted it thick enough for the stitches to stand out. Stitch along the edge of the letter as evenly as you can. Don’t worry if it’s not perfectly straight as the letters are meant to look handcrafted and slightly whimsical. By sewing the letter on the white rectangle first, you’ll be able to hide the back side of your stitches when you sew the white rectangle on the colored rectangle in the next step. Step 6: Sew the White Rectangle on the Colored Rectangle. Center the white rectangle horizontally and vertically on the colored rectangle and pin it to hold it in place. You’ll start by stitching along the top of the rectangle. Fold your 1/2 inch wide ribbon in half and hide one end of the ribbon between the white rectangle and the colored rectangle. Tuck the other end of the ribbon around to the backside and hold it in place by hand. 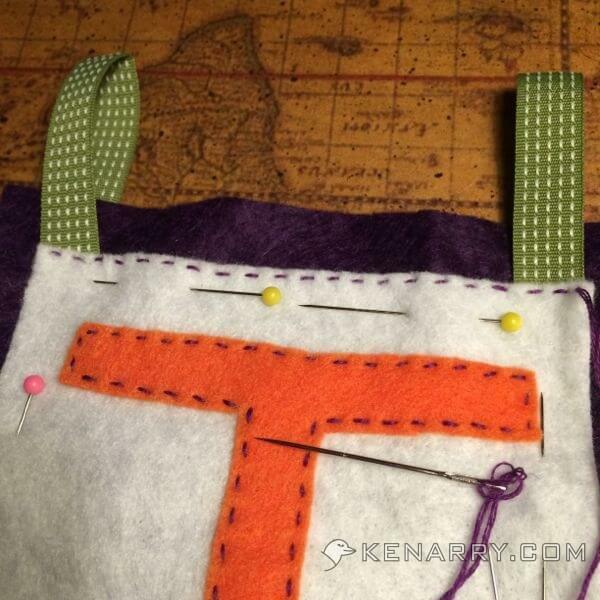 As you stitch across the top, sew both of the ribbon loops into place. Continue stitching all the way around the edge of the white rectangle. Step 7: Attach the Buttons. Use the embroidery thread to attach a button at the base of each ribbon loop as shown in the photo below. Ta da! One of your letters is now complete! 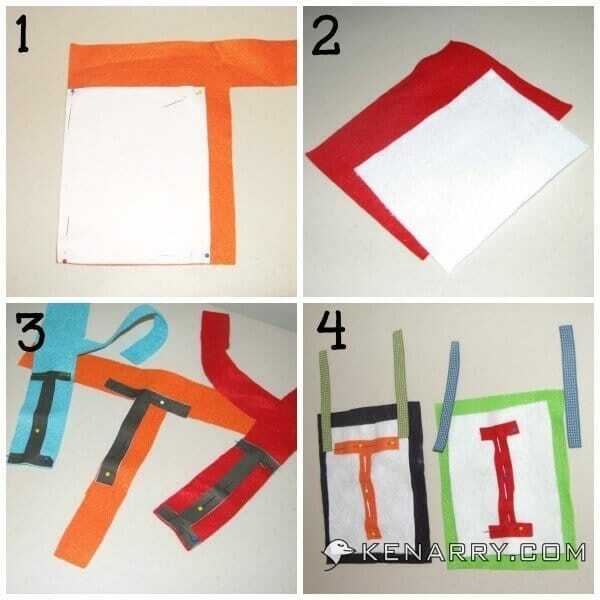 Repeat Steps 5-7 to sew each letter until all the letters in your banner are finished. 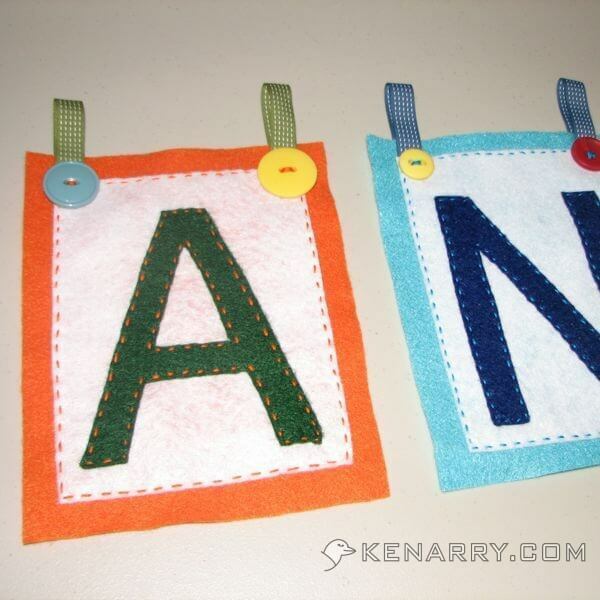 Once you’ve completed all the letters for your DIY felt birthday banner, it’s ready to hang when the occasion arises. I hang ours from our mantle, but you could also hang it from a banister, nails or hooks in a wall or any other creative place you choose. I use three long dowels or stakes to hang the letters of our birthday banner. I also use 1 inch wide ribbons to hang the dowels from one another to form the banner. When the birthday celebration is over, I carefully remove each letter from the dowels and store it in a plastic container until the next birthday. 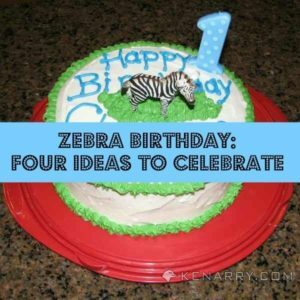 What are your favorite ways to celebrate birthdays in your family? Please comment below and share. We’re always looking for new ideas! Originally published September 2014. Updated with more ideas September 2018. This is ADORABLE, Carrie!! What a lovely keepsake for your family, too. I am pinning this to my sewing board. Love it! I’m so glad you stopped by to check it out, Bre and thrilled that you pinned it too. Thank you! Thank you, Ashlyn. 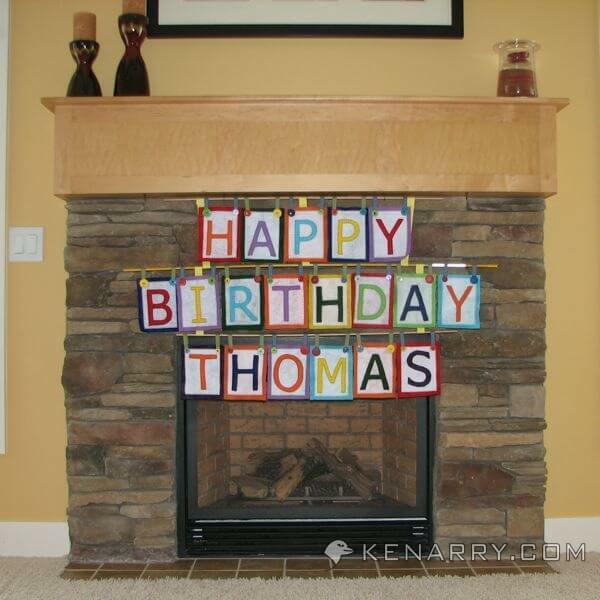 The boys eyes sure light up when they see it hanging on our fireplace when they wake up on their birthday. It was so easy to make. Emily, thank you so much for including our DIY Felt Birthday Banner in your round-up of free sewing tutorials. We hope your readers love it as much as we do. I do, too, Theresa. 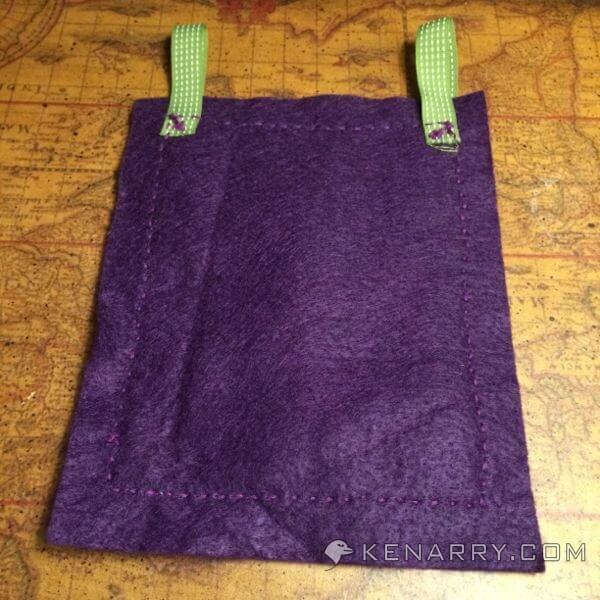 It’s such an easy fabric to work with and doesn’t require any fancy edges. Thanks for stopping by!